What is Music? Is it an Art, a Science, a Practice, or just something that comes naturally? How would musicians have thought about this question in earlier periods? And how have the meanings of all these words changed over the years? Nowadays, we admire a performance that strikes us as ‘natural’, and we shun ‘artificiality’. It’s assumed that a great Artist should not be subject to petty rules. And that the subtleties of Art transcend the limits of Science. In academic circles, Musicology (in German, Musikwissenschaft, music-science) outranks Performance Studies. And those who might wish to call themselves Artists are often looked down upon as mere Practitioners. So how did all this play out around the year 1600? 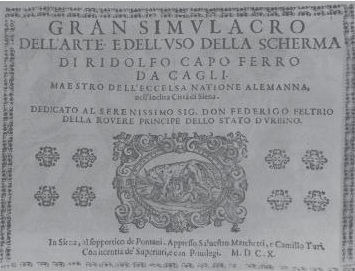 Agazzari’s treatise Del sonare sopra’l basso is one of the most-studied sources for early seicento performance practice. Many of us got to know it through Gloria Rose’s pioneering 1965 article, Agazarri and the Improvising Orchestra, but now both the original (Siena, 1607) and Bernhard Lang’s most helpful 2003 transcription (with parallel translations into English and German) are now available free online. Del sonare sopra’l basso is a key text that I shall certainly return to in future postings on the practical details of ensemble direction and continuo-playing. But first let’s look more closely at the preliminary dedication. It’s all too tempting to skip over this, in the rush to get to Agazzari’s main text, but it hints at answers to my question: What is Music? – answers that are significantly different from those most musicians would give today. The myriad connections between early music and historical swordsmanship are a fascinating topic in themselves, but Falcini’s words strike to the heart of my question. He takes it for granted that music is one of the ‘liberal sciences’. His more subtle point is that Arms are also Science. Music and Arms are both scienze liberali, worthy to be studied by every free citizen. This ‘Great Representation… of Swordfighting’ refers to ‘the Art and Practice’, and although Capo Ferro does refer to the discipline as a Science, he formally defines it as “Art, and not Science”. 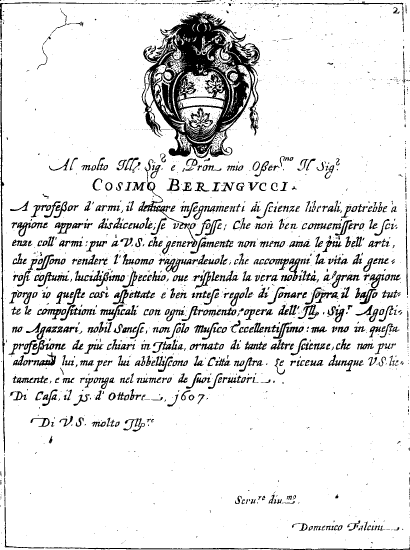 “The term Science, in its strict definition”, he explains, “treats of eternal and divine things that surpass human judgement.” Capo Ferro’s main purpose is to teach the Art and the Practice, not the Philosophy, of swordsmanship. In modern terms, renaissance ‘Science’ includes Philosophy, Astro-Physics, Mathematics and Theology: Astrology and Alchemy also are not excluded. Returning to 17th-century ways of thinking, the Science of Geometry studies Number and Space. The higher Science of Astronomy unites the studies of Number, Space and Movement. Swordsmanship and historical Dance are thus related to Astronomy, the study of the perfect movement of the heavenly spheres. As a Science, Music is only a little lower, combining the two disciplines of Number (pitch ratios and rhythmic subdivisions) and Movement (ie, Time). Capo Ferro also neatly summarises the period view of Nature, Art and Practice. “Art regulates Nature, and with the more secure guidance directs us by the infallible truth and by the organisation of its precepts to the true Science of our [discipline].” This places Nature, Art and Science in a hierarchy: Art is a means of organising Nature according to rational precepts, in order to approach the ‘eternal and divine’. And what then is Art? “Art… is a system of perpetually true and well-organised precepts”. A renaissance ‘Art’ is thus a set of rules that bring disorderly nature towards heavenly perfection. But are such rule-sets really ‘perpetually true’? I suggest that we can accept that they are perpetual, if we understand them not as abstract rules (you must always do this), but as precepts that guide Nature and your Practice towards the high perfection of a desired result. Different Arts will desire different results, and have different rules. Thus Capo Ferro’s set of rules still work very well indeed, providing that your intention is to defend yourself in a duel to the death with long, sharp rapiers. If you are trying to score points in a modern fencing competition using lightweight foils, without needing to kill your opponent, you need another set of rules. Similarly, we can trust Agazzari’s rules if we are playing seicento music on early instruments, with the period intention of ‘moving the passions’ of our audience. But if we are playing say Romantic repertoire, with the 19th-century intention of expressing the performer’s genius and sublime depth of feeling, we probably need another set of rules. Historical treatises on Swordsmanship also deal with down and dirty questions of uso, Practice, as opposed to Art. However well you understand the precepts of the Art as an intellectual construct, you still need to practice assiduously to acquire physical skills. Musicians can certainly relate to that. And some of what one does in Practice falls a little short of the divine perfection that Art would have us aspire to. A swordsman might stab you with his dagger, rather than with his sword, the Queen of Weapons, if it would save his life. Continuo-players might accept less-than-perfect contrapuntal move, if it preserved their concentration on the vital priorities of text and rhythm. Many historical treatises leave space for practical subtleties which cannot be written down, within the limitations (and rules) of period notation. Now we can understand how the word ‘artificial’, in its 17th-century sense of ‘full of Art’, is one of the highest compliments awarded to fine music, both in composition and performance. In the original sense, ‘artificial’ music takes something Natural, subjects it to the Precepts of that particular Art (since of course, Monteverdi’s Art is not quite the same as Purcell’s), in order to bring it as close as possible to the summit of heavenly perfection. In this period view, Nature, Art, Practice and Science all have their place. But those philosophical terms, and their respective places in a hierarchical value-system, differ from our modern understanding. Is this just a quirky detail of historical philosophy, or might it change how we approach the Practice of playing old music today?